For the past two and a half years, my day job has been in the technical design department for a very large fashion company in Philadelphia. A couple of months ago, this company took note of my personal blog and asked me to start an Intranet blog that would create a cohesive voice for all their brands. Cool, right? I consider myself one lucky gal to be able to do what I love both day and night (blog and sew), not to mention I receive a stellar discount off some really fancy clothes. Even though I worked in the technical design department for knits, intimates and sweaters and handled a lot of elastics, chainstitches, zigzag stitches, stretchy fabrics and straps encased with mobilon, when it came to actually sewing these types of garments, I struggled. For the six years of my sewing career/hobby, woven tops, dresses and jackets have been my thang. I could/can make one hell of a dress, one full of cowls, ruffles, flounces and shirring, but sewing any type of stretchy garment was a challenge. But, about six months after working in the department, my feelings changed and I grew a liking to the product. 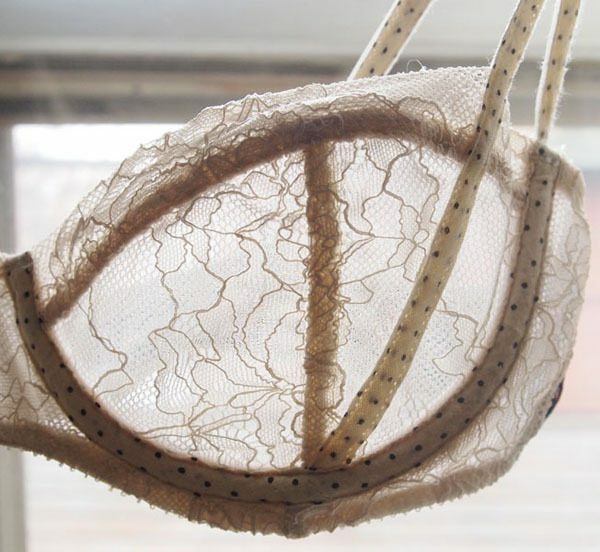 The antique, feminine, and dainty touches of the category got to me and after two and a half years of working on the product, I finally decided to make one (a bra). And you know what? I found out the secret to lingerie patterns while working on my project. The secret to lingerie is seams. Lingerie is close fitting – it’s the closest thing that is on our bodies other than jewelry. In order to make a 2 dimensional piece of fabric fit a 3 dimensional body, in this case, the bust, seams, or another other form of projection (shirring, darts, etc.) are necessary (I’m stating this assuming that the lingerie does not have cups because cups are shaped to fit the bust). The bands of lingerie are straight pieces but when it comes to bra cups, they’re usually separated into top and bottom panels or left and right panels (as shown in image above). If the cup is separated into top and bottom panels, then sometimes the bottom panel is separated again into two panels to achieve a closer fit. If the lingerie does not have panels, then shirring or darts are usually placed underneath the bust to provide projection. For the pattern makers and seamstresses out there, this means good news and bad news. The good news is that there aren’t many seams to deal with. The bad news is that meticulous fitting is the only way to achieve a good fit. I suggest buying a bra pattern, sewing it up and spending way too much time fitting it. Pin out, slash and open, do whatever it takes to make the bra a second skin. I promise you that once you achieve a good pattern, you’ll use it for ages. For the shoppers out there, I also have good news and bad news. The good news is that finding great-fitting lingerie is possible. The bad news is that it takes a lot of trying on. I suggest that you go out and try on as much lingerie as you have to until you find “your” fit. Just like the pattern maker, once companies achieve a good fitting pattern, they stick to it. So when you find the bra that fits you best, buy many and never deviate unless the company has! 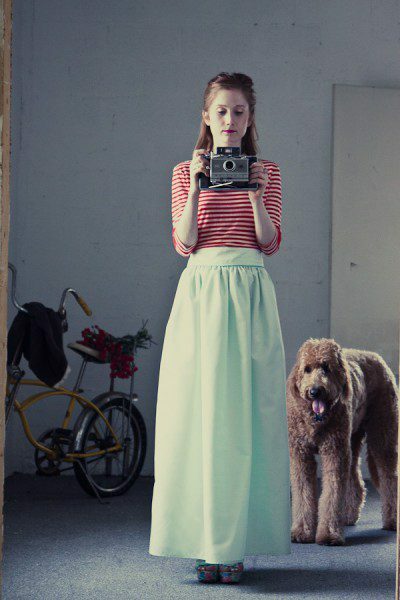 I am the blogger behind Madalynne, the cool sewing and pattern making blog. If Steve McQueen was the “King of Cool”, then Madalynne is the “Queen of Cool”. 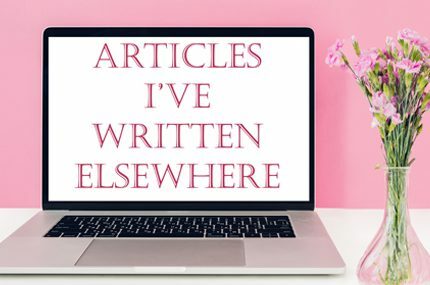 My blog covers everything from how to draft a sloper to interviews with independent pattern makers/designers and what projects I’m working on. I envy your talent. I am taking some fashion courses and hope to create something in that realm one day — Keep on creating your wonders.